I think because I posted it on Tuesday everyone thinks today and tomorrow are the Penny testing days. But really it is next week. I did write that, I swear. But you are busy people and usually I am a prolific blogger. Except I haven't been for a million and a half reasons that are boring. This morning I played the "what's wrong" game with Penny. Up crying at 5:30 am. Switch her into other room. Crying. Get bottle and feed her a few ounces. Crying. Change diaper. Hmmm...2 days without a poop. Give stool softener (which we give her every day). Crying. Give Tylenol. Snuggle crying baby. Baby drifting in and out of sleep on Mommy. Crying. Ah, found it - I feel a tooth. Same first one Ned cut. Same completely horrible teether. This being "honest" Thursday I feel the need to admit that after 3 months of holding off the worry it is starting to consume me. My kids are almost 10 months old (next week) and were NOT premature babies - why no crawling? No pulling up? Okay, so Penny still has feeding issues but they both WANT to stand - but can't seem to make any connection with how to do it on their own. I have different height objects they can safely pull up on. They spend lots of time on the floor on their backs or sitting. Ned rolls around. There is no crawling. And I've resisted the comparisons when their "friends" started crawling at 6 months to start, then some at 7 months and the last at 8 months. Sure, sure it's not like Ned or Penny will be in college without having learned to walk or crawl or potty train. I just feel like there is this "intelligence" that is linked to certain milestones like crawling and telling their first joke (FWIW I don't think table food or potty training ranks up there). Stupid I know. But there you have it. Ok, I'm one of the readers that didn't read careful enough. Sorry. Hmm...on your question with crawling. I will be interested to hear from people with children your kids age since mine are teens. Have you asked that question at recent doctor visits? Do they try "scooting" (lack of a better word) around - in other words try to get to you if they hear you in another room? I ask because I had one that was "lazy" and did a body crawl type move =) He eventually turned that into crawling. Neve started something that kinda looked like crawling just after 9 months. My good friend with twins told me hers didn't start until 10 months and then they walked shortly thereafter (less than 1 month later). Neve's been crawling for 2.5 months and shows NO signs of walking on her own. None. Zip. Zero. I'm thinking she's going to give my record of 15 months a run for its money. Bottom line -- they are all so different. I'd tell your pedi if by their 12 month appointment they are still not somehow getting across the room. **Hugs** It's so hard not to compare, I know. Interesting question from Susan. Ned rolls to where he wants to go. Penny does not. Both get ridiculously frustrated and cranky and I think part of this "comparison" is my desire for them to LEAP and leave the crankies behind for at least a little while. S. didn't crawl properly until past 10 months. She army crawled before that. She spend two months in day care starting at 10 months and after literally 2 days there she was crawling around like a rocket. This is a stupid question but have you shown them how to crawl? They are so into imitating at this age that maybe they need to see someone doing it? The only advantage of having a toddler with little ones - S. does all of the crawling demonstrations and I can stay off of the floor. I have a nephew who crawled very little and only after he was 1 year old. Perfectly normal kid. EI told us that "normal" time range to crawl is 6-11 months. It's not until they are over 11 months that they worry. At all. Abigail was 10.5 months---no movement at all before them besides rolling---and is absolutely on track at 26 months as far as gross motor is concerned. Danny was 8.5 and I considered that pretty early---I think you might just be seeing some really mobile kids. Six months is ridiculously early. Chat with EI about it if you're worried. Daniel didn't crawl until 10.5 months. He sat there watching Rebecca do it for more than two months. No matter. He was apparently in no rush. If I had to put labels on the boys which I REALLY hate to do, I would say generally Nate is "smarter" in Alex, as in classically smarter. He understands things a lot faster, talks about complex concepts, can write all his letters. Alex just has different interests and a different learning style. He is too busy running around to care about writing. Nate crawled 3 months after Alex crawled. I think it just depends on the kid and their skills. Alex crawled early bc he just really likes to be moving around and checking things out. We did nothing to encourage this behavior. He just always hit physical milestones early. He is a physical kid. But Nate always waited on physical milestones until he could do it perfectly. It took Alex weeks to go from 2 steps to fully walking. It took Nate 3 days. It took Alex weeks to scoot two inches to actually get across the floor. The first time Nate crawled he did it across the house. I like that you're keeping it honest! I worry too! F and J started crawling on their 9 month b-day (one of the few milestones I remember). They were ahead of some kids their age, behind in others. Their best buddy started WALKING at 9 months. I think you have a good reason to be concerned (penny's slow growth), but try not to let that bleed into other area's of the kids development, as you will drive yourself batty! Often it helps me to turn my worried thoughts into prayer. I'm trying to think of when Maggie started crawling...I know that it was long after Burke...I agree with the others though. Don't worry too much about the crawling. You've got enough worrying on your plate! A good friend of mine never crawled - skipped right over it and went straight to walking at about a year. His son did the same. It's possible this could be the path your kids end up taking. Hmm...I don't think its such a big deal. I have also heard of babies skipping the crawling thing. And a lot of kids who crawl don't really do it, they just scoot on their bellies like they're in some sort of military camp. It is hard not to compare. Not to be Type A. Not to want them to be the best, fastest, first, smartest! FWIW, my oldest, a singleton, was overdue and 8 pounds, 10 oz at birth. She didn't crawl until past 9 months. And it wasn't much of a crawl. She didn't walk until 14 or 15 months. She is over 2 now and still runs stifly and falls often. She has to have help for stairs. She can't jump. BUT she's very smart. Extremely verbal and very easy to understand. She's studious and... just like me! My son (a singleton) started crawling at 8 months with a full-on belly-up crawl. He pulls up on everything. He is super active. Why? Kids! They're just all different. I think because I had one and now have two; and because one's a boy and one's a girl; and because they're SO different that it really doesn't bother me to compare them to each other and to other kids. But, still, I hope they start to crawl soon so you can all enjoy it. Your twins are so cute. It is hard not to compare them to eachother and to other babies, but I'm sure they will crawl when they are ready, and only they know when that will be! It is hard not to worry though, mine are 7.5 months and still not sitting up on their own entirely! I called my ped. for reassurance and he said "normal" is a big range! 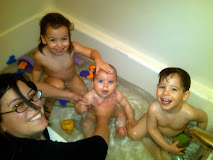 Josh crawled (commando style) at 7 months, but Alex not until 10 months (crab-style, on one foot and one knee). I dunno about the imitation thing- with the exception of rolling over, Alex hit all his big physical milestones behind Josh, and he had Josh there to imitate. [shrug] There are many variations of normal. I am pretty sure crawling is no longer even considered a developmental milestone, since so many kids skip it, or find an alternative, like scooting or Ned's rolling. Hang in there mama. I know it's hard not to worry, but I have seen those babies and they are precious and perfect!